Lowcock’s Lemonade Navigation History > Bottles (this page) > Signs > Transport > Misc. Thanks for visiting the Lowcock’s Lemonade Bottles memorabilia page. I am NOT affiliated with Lowcock’s Lemonade in any past, present or future capacity. I just share the same name. If you’re interested in the Lowcock surname you can read up Lowcock Genealogy and about me here. This Lowcock’s Lemonade Bottles page includes photos of various vintages of Lowcock’s Lemonade bottles from originals that required a deposit to the bottles that were used during the brief re-launch. 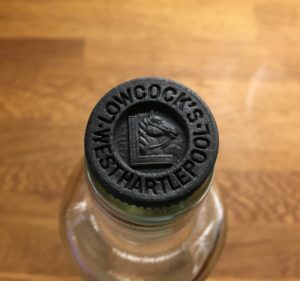 This is currently the best photo I have of a Lowcock’s Lemonade Bottle, it was discovered by Malcolm (who shared with me, thanks!). 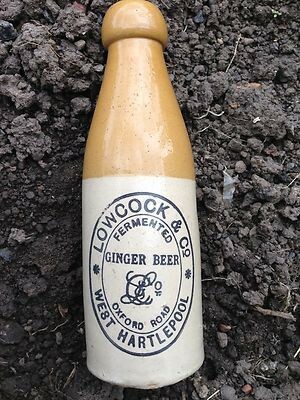 Malcolm discovered the bottle in West Hartlepool, half buried in soil, with a tree root growing over it. It also still has the original stopper. 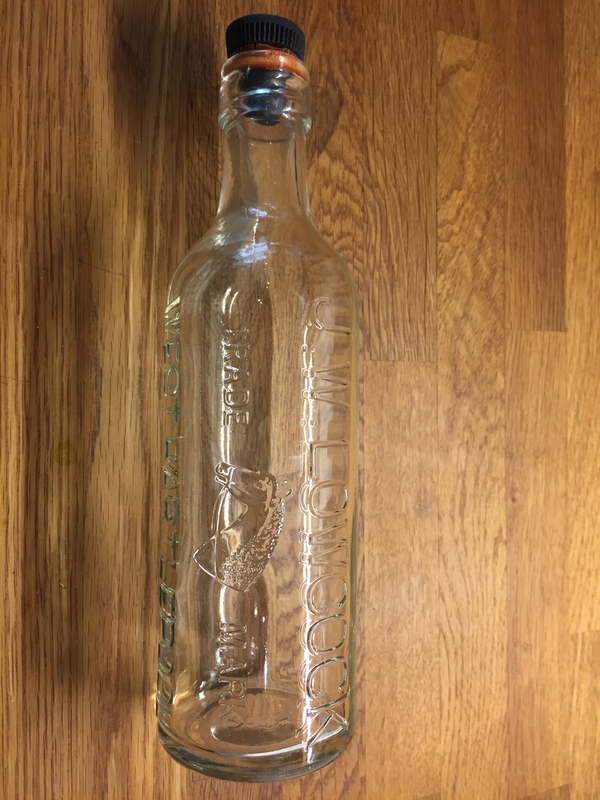 The bottle measures 10.5″ in height and has been cleaned thoroughly (click to expand). The next photo is the best photo of a Lowcock’s Lemonade Bottle. It was taken by Christine, whose colleague found the bottle in the village of Danby Wiske Nr Northallerton, buried in the undergrowth in a field. As you can see, the bottle has been cleaned. They were also kind enough to let me know the bottle stands at 8.5″ tall and the stopper isn’t the original. 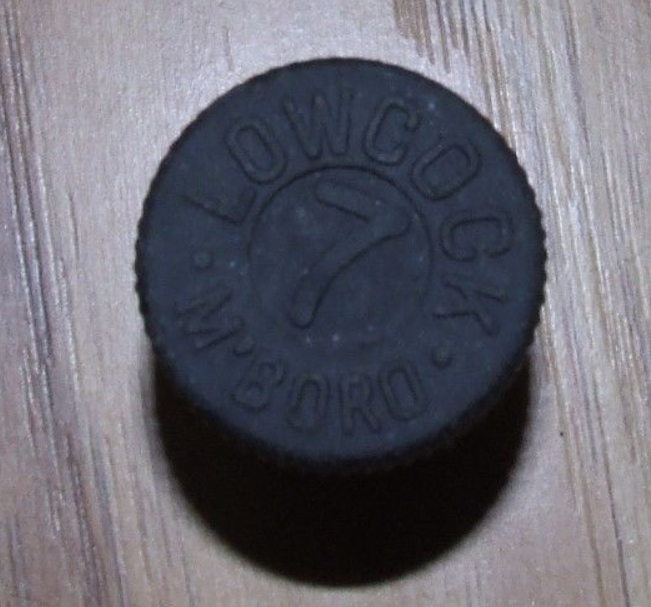 The words Lowcock and Middlesbrough can clearly be made out on the side. I discovered a similar bottle to the above on eBay (no, I don’t own it) which has part of the original label. 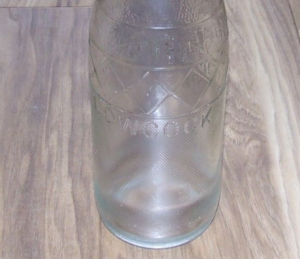 The bottle was described as a World War II bottle, with ceramic twist lid. The photo below is a buried bottle that hasn’t been cleaned (hence the dirt). You can see the name Lowcock embossed on the side. Photo courtesy Tees Valley Museums. Interesting aside, the Tees is the name of the river that runs through that part of the Northeast. 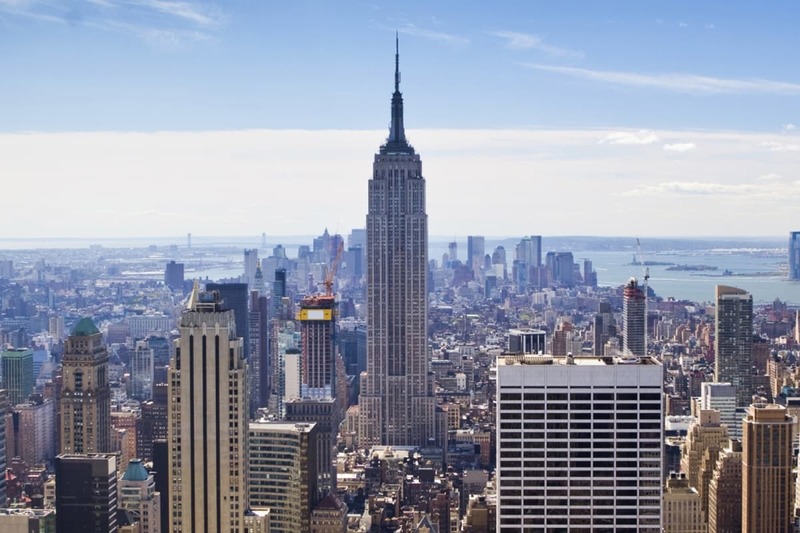 The towns on either side of it are what make the area known as Teesside (Stockton-on-Tees, Hartlepool, Middlesbrough, and Darlington). I am not sure of the vintage of this bottle. 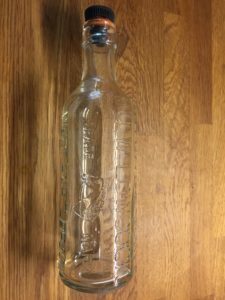 According to an old eBay listing, the bottle is ceramic and measures 8″ high and 2 3/4″ wide. 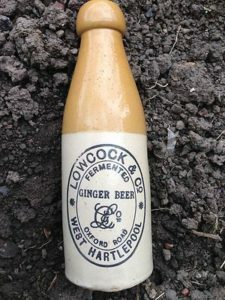 The bottle references Lowcock & Co, Fermented Ginger Beer. 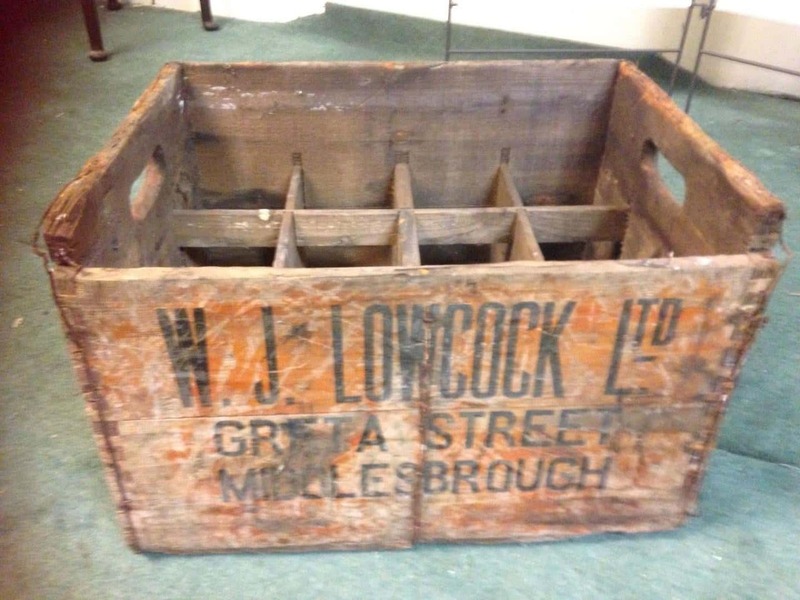 It has an address for Lowcock’s Lemonade, Oxford Road, West Hartlepool. 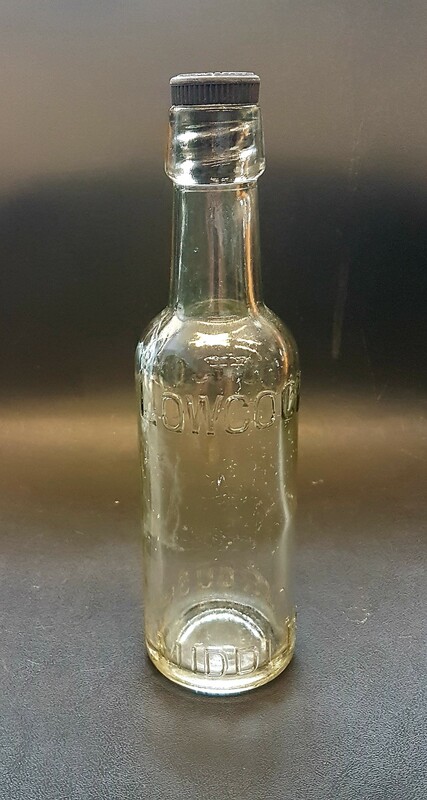 This next bottle turned up on an eBay listing (no, I don’t own it). It’s a different vintage from the others but does include (and feature) a reusable Lowcock Bottle Top. I only have zoomed in images so you can see the detail, click to expand the thumbnail. And here’s the bottle stop. 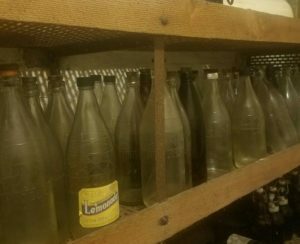 Thanks to Avis Carter, I have a photo of a whole shelf of (empty) Lowcock’s Lemonade bottles. Avis’ late father used them for homebrew and the bottles are in excellent condition. Of note, one of them still has the original Lowcock’s Lemonade label. The photo below is not one of the original bottles, but it is definitely not the re-launch version of the bottle (2006 relaunch bottles were plastic). The image below is as I found it, which is a shame – because it looks like a Lowcock’s Lemonade ad is in the background (you can make out labels of other flavors). I wasn’t sure where to put this photo, it’s dated April 1990 and comes from Teeside LIve (the local paper in the area). 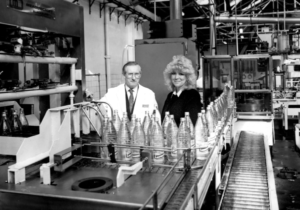 The photo (click to expand) is of John Lowcock and Gayle Gerrard at the Lowcock Lemonade factory. The news story was about potential tours of the Lowcock Lemonade factory. From the 2006 relaunch, here’s a photo of the bottles. A little hard to see, but the bottles do say Established 1880. The following picture is a bit more random. BeSpoke Tyre and Autocare in the UK took over the Lowcock’s Lemonade factory (probably the re-launch factory, as their address is Derwent St, Middlesbrough) and shared the following “treasure” on Facebook. 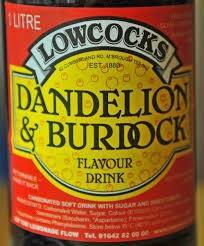 This includes a (partial photo) of a bottle of Dandelion and Burdock. 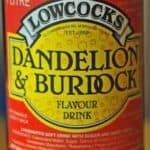 I often get asked for a bottle or crate of Lowcock’s Lemonade. 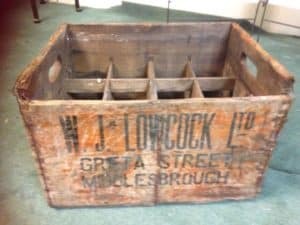 Courtesy of a (now offline) eBay listing, I found a photo of one of the (original) Lowcock’s Lemonade crates. 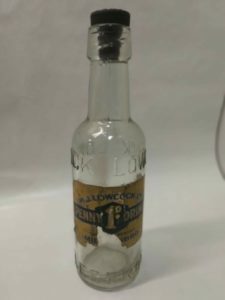 How does one go about opening Lowcock’s Lemonade bottles? 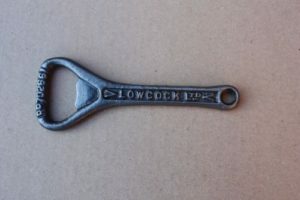 Well with the Lowcock’s Bottle Opener of course. This bottle opener was listed on eBay. The front of the bottle opener states “Lowcock” and the reverse states “Middlesbrough”. According to the listing, the opener is about 10cm long and had the registration number 702661. This is the patent number for the design, known as a “Crown Cap” and dates the opener at around 1924 and is common for bottle openers of that period. Navigation Bar: Lowcock’s Lemonade History > Bottles (this page) > Signs > Transport > Misc.